So yesterday morning I turned on The Sandwich King show on the Food Network. The host of the show, Jeff Mauro, is the most recent winner of the Next Food Network Star. I like Mauro, but I didn’t really think I would be able to get much out of his show since I can’t have bread, even the gluten free varieties. I’m not big on almond flour bread for sandwiches. To my surprise he had something I could make. It’s not SCD, but it’s completely gluten and grain free! He used a plantain in the place of a bun. 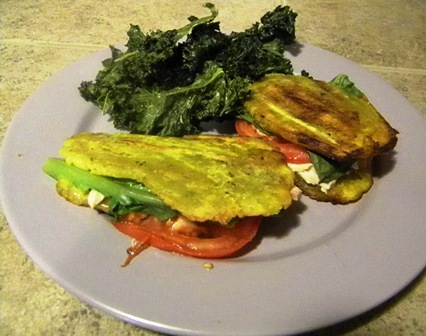 Since I do eat plantains (check out plantains and Crohn’s articles) I knew I had to try this out. He didn’t mention the benefits for gluten-free followers, but he totally could have. This was an idea I had never thought of, so I’m glad I tuned in to his show. His recipe was for Jamon Jibarito which looked good, but I decided I wanted to make a panini. His plantain was also deep fried, where I steamed and pan fried mine (as you will see below). Cut plantains in half and then in half lengthwise. Put into a pan with a little water (just enough to cover the bottom of the pan), over medium heat. Steam plantains for about five minutes until they are a little soft, but not mushy. Pour a tbsp of olive oil into the pan and fry on each side for 2 or 3 minutes – until they are a little browned. Remove from pan and plan on paper towels for a few minutes to cool slightly. To flatten plantains place on parchment paper and fold paper over to cover them. Take a frying pan and press firmly in the middle of the plantain. This should flatten it to about a quarter of an inch or a little more. You want it to be thick enough to be able to pick it up and not have it fall apart once all the toppings are on. Place flat plantains back in pan, add a little oil if necessary, and cook on each side for two minutes. Remove back to paper towels. Layer on sandwich toppings, mustard, cheese, chicken, tomato, lettuce. If you don’t have a panini press (I have a Griddler), you could eat it as is. If you want to make a panini – place sandwiches on grill according to instructions. I grilled mine for about five minutes. This recipe being shared on Slightly Indulgent Tuesday.